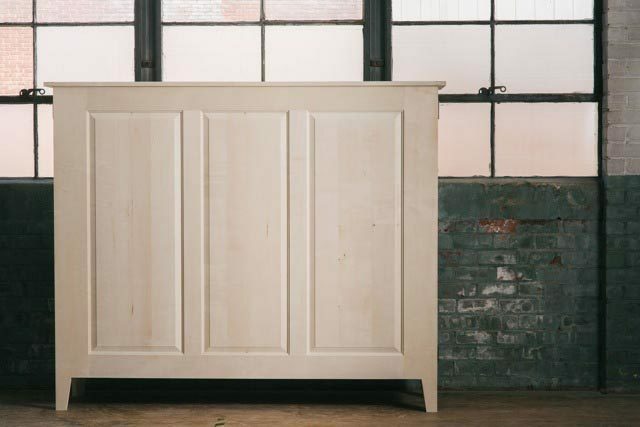 Shaker inspired in the truest sense of the word, this is not a reproduction piece it is a new design that takes advantage of vernacular details in a different way than might be expected. 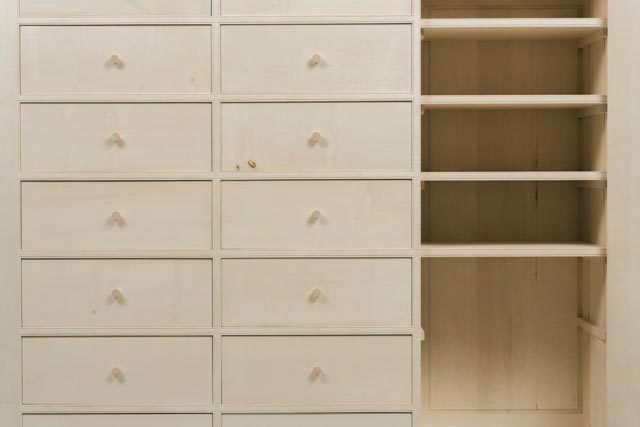 Unlike built-ins of similar size, the pantry is a free standing piece of furniture that is capable of being placed in the middle of a room just as well as against a wall. Wide structural rails conceal two side cabinets on either end of the pantry which are fitted with adjustable shelving and hanging pegs. A large cabinet flanks two rows of drawers on the right side of the pantry creating an asymmetrical balance to the piece. 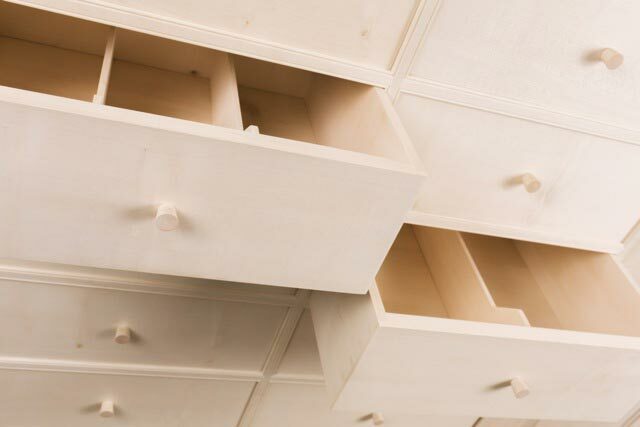 The main cabinet adds ample, flexible storage space being out fitted with adjustable, solid wood shelving. Ball bearing catches hold all doors shut, which are coped, floating panel and all made with pinned mortise and tenon construction. Pulls and hanging pegs are custom turned throughout. The piece is made entirely of solid wood from a single English Sycamore tree, no ply wood or pre engineered material has been used anywhere. 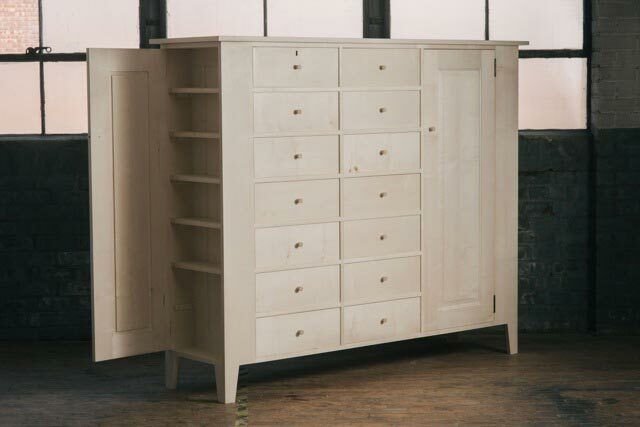 It has sixteen drawers in all, including two concealed smaller drawers within a keyed top drawer. 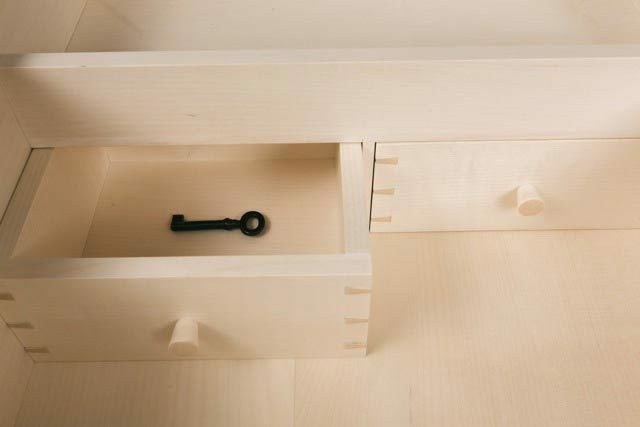 Drawers are made in the "French style" which is a "piston fit" (no sliding hardware) type drawer that has hand-cut "blind" dovetails in front and through dovetails in back, solid bottoms and partitions are removable. Hand cut joints are easily recognizable and different than their machine cut equivalents as being more elegant and slender in their geometry and lay out. The lengthy process that goes into cutting these type of joints creates incredibly strong, unique drawers. Attention like this is a rare detail in furniture made today. The sentiment and inspiration behind the piece highlight the craft of wood working in a way that purposefully defies modern production methods and celebrates the timeless notion that there should be a place for everything and everything should be in its place. For more information or to commission a piece please contact info@joshua-vogel.com.